In theory, deviled Egg season began in earnest this weekend. I say in theory because I do not follow the convention that deviled eggs are a summer food. I like them year ’round. 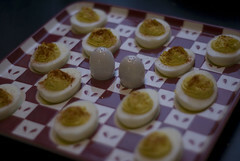 I have been mocked by friends when I show up at a wintertime soiree with deviled eggs in tow. To be clear, that is only friends who have never sampled my deviled eggs.